Büdingen, Hesse, Germany is located about 30 miles east of Frankfurt. Back then Büdingen, Aulendiebach and Calbach were separate villages. Today Aulendiebach and Calbach are municipalities of Büdingen. All of the Büdingen Church records are from Marienkircke (church). Heinrich Pinnecker von Düderode (near Braunschweig) and unknown wife. Johannes Pinnecker was the apothecary to the Count (Graf) of Ysenburg. He was born about 1638 (possibly in Düderode) and was buried May 22, 1702 in Büdingen, Hesse, Germany. She was buried May 21, 1683 in Büdingen, Hesse, Germany. Ernst Wilhelm Pinnecker christened July 05, 1665 in Büdingen and died August 20, 1684 in Büdingen. Anna Eleonora Pinnecker christened June 20, 1668 in Büdingen. Johann "Georg" Pinnecker was born February 08, 1722 in Büdingen. Georg Henrich Pinnecker was an apothecary born in Büdingen. Johann "Georg" Pinnecker born February 08, 1722, in Büdingen, Hesse, Germany. He was a master locksmith. He departed Germany and arrived in Oranienbaun (not far from St. Petersburg) onboard the ship, "Love and Unity 2" on July 04, 1766. He and his family arrived in Moor Colony near Saratov, Russia on June 18, 1767. He died before 1804 in Moor. Anna Elisabeth Pinnecker born between 1756 and 1757 probably in Germany. Johann Heinrich Pinnecker born 1759 probably in Germany. Ernestine Pinnecker born between 1760 - 1761 probably in Germany. Georg Pinnecker born between 1765 and 1766. He could have been born in Germany, Russia, or in transit. Sibilla Pinnecker born probably in Moor. Georg Friedrich Pinnecker born probably in Moor. Magdalena Pinnecker born probably in Moor. Johann Christoph Pinnecker born probably in Moor. Georg Carl Pinnecker born 1778, Moor Colony, Russia and died June 05, 1852, Moor Colony, Russia m. Anna Maria Engal. She was from the Anton colony. Children: Johannes Pinnecker, Anna Catharina Pinnecker, Johann Adam Pinnecker, Anna Margaretha Pinnecker, Maria Elisabeth Pinnecker, Johann Ludwig Peter Pinnecker, Anna Louise Pinnecker, Anna Louise Pinnecker, and Maria Barbara Pinnecker. Children: Johann Conrad Pinnecker, Heinrich Jacob Pinnecker, Johann Caspar Pinnecker, Maria Elisabeth Pinnecker, Maria Louise Pinnecker, Johann Michael Pinnecker, Johannes Pinnecker, and Maria Barbara Pinnecker. On the back of this photograph was written "one of the Peaneckers" NOTE: The words at the bottom of this photograph are written in Cyrillic and probably translate into "Saratov" and the name of the photographer. Lizzie Pinnecker (Filbert), and a younger brother. 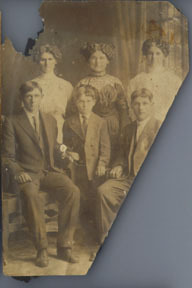 Children: Anna Maria "Mary" Pinnecker, Johann Heinrich Pinnecker, Catharina Maria "Mary" ( Niedens) Pinnecker, Catharina Elizabeth "Lizzie" (Filbert) Pinnecker, Elisabeth Pinnecker, Emile Pinnecker, Amalie Pinnecker, and Heinrich Jacob Pinnecker. born November 04, 1857 in Moor Colony, Russia and died October 19, 1912 near Garden City, KS (perhaps Deerfield, KS). She married John Fredrick Gieswein and they lived in Moor and Gnadenfeld colonies near Saratov, Russia. They immigrated to USA in 1886. See the Gieswein family for more details.